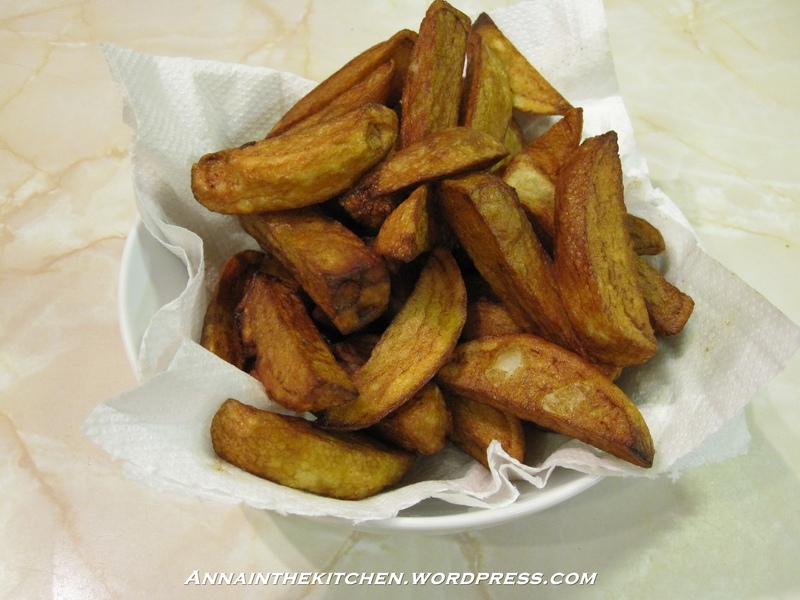 If you like homemade chips I have a couple of tips that might help make them even tastier. Try to use floury potatoes for light, fluffy chips. Soak the uncooked chips in cold water for a minimum of about 10 minutes, then dry thoroughly. This removes some of the starch making a softer, fluffier chip. I always cook the chips twice too, first on a lower heat (180-190 deg C, or lower) for about 6 minutes or until they are soft and yellow, but not golden. The second frying is as hot as your oil will go for about 2 minutes. This makes the chips lovely and fluffy on the inside and crisp and golden on the outside. I think this makes better chips than any chip shop, and they’re not as unhealthy as you think as they don’t absorb that much oil.